A high altitude resort with glacier skiing, Solden has a long ski season and is the venue for the opening World Cup races in October. It also has a lively nightlife which has made it a popular resort. 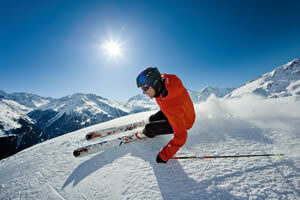 It may lack traditional charm but has great skiing to suit all levels and a good infrastucture. Sölden now has gondolas on three mountains more than 3000m high at the Rettencbach glacier, Tiefenbachkogl and Gaislachkogl. Each of these 'Big3' has a viewing platform at the top giving 360 degree views. There is also a 'B ig 3 Rally' to try, taking in more than 10,000m of vertical in around four hours of hard skiing. In summer time the whole area is a fabulous destination to enjoy breathtaking mountain scenery and the hundreds of activities associated with this sort of environment. ice skating, tobogganing, sleigh rides, cross country skiing. sports & fitness centre. good choice eating places, including hotel restaurants. Simple pizzas, fondues, austrian specialities are all available. very lively apres ski. Live music, dancing (including on tables), and a range of atmosphere, from laid back to hectic, all available. marked walks, sports centre with adventure pool, saunas, steam roons and indoor tennis, Aquadome Spa in Langefeld (bus from Solden).